If you are in need of a Madagascar passport photo or visa photo then Reload Internet is the best place to come. 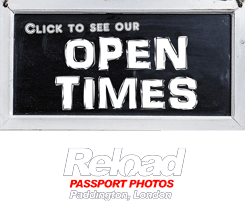 We are a professional passport photo studio that has been in operation in Paddington for well over a decade, and we take hundreds of passport photos every week. Our store is located on the same street as Paddington tube station and train station, and stays open throughout the week, meaning you can come and have your Madagascar passport photo or visa photo taken at a time that suits you! You don’t need an appointment with us, just stop by and we can have your photographs ready within 10 minutes of your arrival. A member of our staff will capture your photo with the correct lighting & background, and will then cross check it with the Embassy of Madagascar’s guidelines to ensure that it meets all of the necessary criteria. After ensuring it will pass, we will print it using the latest passport photo printing machines. Finally we will cut it to size, so you can submit it with your application straight away. This process is why we can guarantee that your Madagascar passport photo or visa photo will pass first time when you submit it with your application to the Embassy. You must make sure that your Madagascar passport photo meets all of the requirements below, as if it doesn’t then it’s likely your application will be rejected because of a photo error. 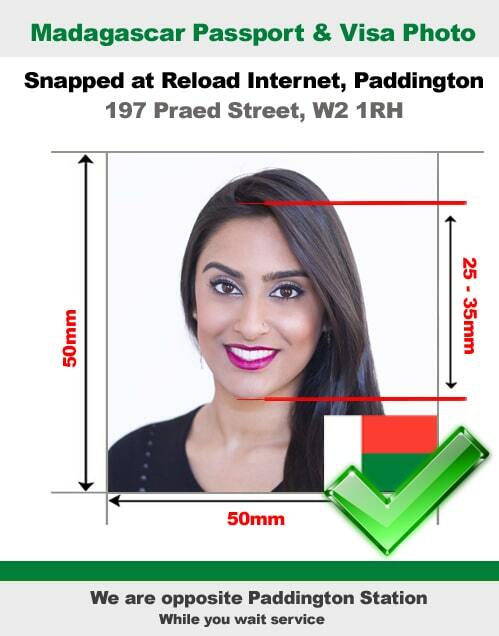 We guarantee that this will not happen to you when you have your Madagascar passport photo or visa photo taken at Reload Internet. A perfectly neutral facial expression should be maintained. While snapping, you should not be caught laughing, smiling or frowning. Both eyes should be moderately open and squinting should be avoided. It is important for both ears to appear in the passport photo. Therefore, you must look straight at the camera without moving your head in any direction. When taking passport photos, a pair of glasses should not be worn. This is because facial features of the person being photographed will be hidden by the glass frame. It is important to be well rested before taking your passport photo. Being well rested will help whiten the colour of the eyes as this is very important. Head gears are not permitted when taking Madagascan passport photos. However, head gears such as hats and scarfs, hijabs and turbans can be worn for religious reasons. When worn, they should not cover the forehead. A coloured 51mm x 51mm passport type photograph, back ground should be plain white. It is important for the passport to be few weeks old. Before gaining entry into Madagascar, an international certificate of vaccination is required. It must include inoculations for Malaria, hepatitis A and Cholera. A proof of departure is needed, it should be a computer generated flight itinery from a travel agency. It should show entry into and departure from Madagascar. An official letter is required by the consulate of Madagascar. This is to act as support for your application. A company letter headed letter is needed. It should be from an employer and should show the applicant’s employment status and also position held in the company. Included in the business letter should be the financial sponsor of the applicant. A police clearance issued by the applicant’s country of origin should be provided. It must not be more than six months old and should be written in English or French. If you are an employee, you should present a work permit which should be signed by the ministry of works. If you are coming in as an investor, you should present registered articles of the company, a banking certificate of the company, a tax identification card, statistics card of your company. If you are coming in as a religious missionary, you should have a certificate of membership, a certificate of existence of cultural association, which should be issued by the interior ministry and a hosting certificate which should be issued by the applicant congregation. The congregation must be legally established. We receive our specifications from the Embassy of Madagascar’s guidelines on passport and visa photographs, which can be found here.